Going to the doctor should not be something stressful. There needs to be a mutual respect to ease the communication between you and the physician. This is the best way to facilitate healing. Dr. Marina Gafanovich understands and believes in this, making her one of the top internists in New York City. 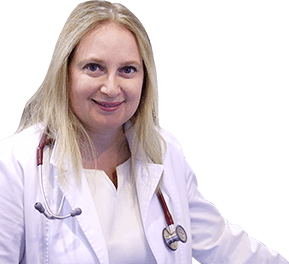 Dr. Gafanovich attended the Sackler School of Medicine, receiving a medical degree in 2002. While completing her residency at Manhasset’s North Shore University Hospital, her dedication to her patients, and impressive knowledge and skills as a doctor gave her the position of Hospital Care Attending Physician. She worked at the hospital for many years before joining a private practice, working with like-minded doctors who understood the need for personalized medical care. Since 2008, she has been the sole physician at the practice, continuing with the same dedication and commitment to caring for her patients. When you first walk into Dr. Gafanovich’s office, you know you are going to be treated as a person, not a number or disease. It does not matter if you are coming in to be treated for high blood pressure, or you are being tested for an STD, the staff and doctor take the time to understand how and what you are feeling. Your treatment plan will be constructed around you and the way you live your life. Dr. Gafanovich knows that each disease has an underlying cause that may be different from patient to patient. She also understands that everyone responds to a disease differently psychologically. It is important to her that you are not only treated for the physical manifestations of the disease, but the emotional aspects of it too. This can be especially important when treating issues that involve sexually transmitted diseases. You will be involved in every step of your treatment. Your input is crucial to making sure you are able to heal completely, without any added stress or problems. You are encouraged to discuss any trouble you are having with a treatment. If you find that it is not fitting in with your lifestyle, or creating other health concerns, the doctor will work with you to make changes that will work better for you. It is important that you trust your doctor and her staff. Once you have given that trust, you can be sure that it will be given the respect it deserves. Dr. Gafanovich and her staff work hard to provide you with some of the best medical care in the world.